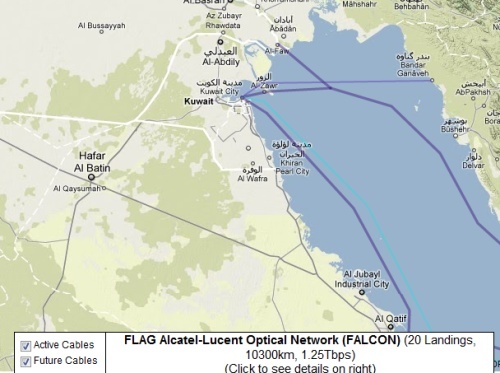 I have always wondered what are the speeds of the fiber optic cables reaching Kuwait and the land based cables reaching Kuwait. Whenever we face an issue with slow internet they blame cut cables, even when it isn’t the case, they just find it convenient to say that. I just came across this website which documents a very large majority of all the fiber optic sea cables in the world, their speeds, when they were connected, and a lot of other information. You can tell what is landing in Kuwait and the speeds. 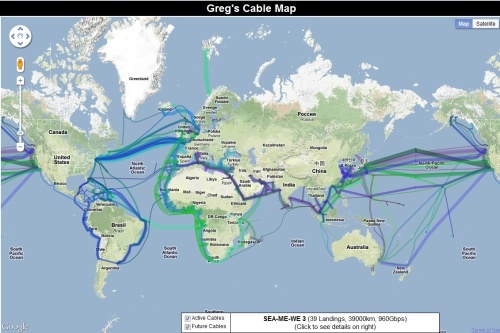 This is supposed to be the sea based map, I hope that it incorporates the land based fiber information at a later point, at this point in time we have a higher dependability on land based fibers coming from Saudi Arabia then we do sea based fibers, and Kuwait is in need of a lot of bandwidth.